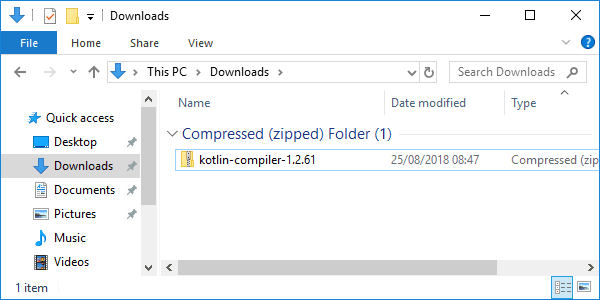 So you want to download and install Kotlin on Windows? A key aspect of Kotlin is the interoperability with Java. You can write Kotlin and Java code in the same project and they’ll work hand in hand. Kotlin originated at JetBrains and has been open source since 2012. Kotlin needs a JDK to work. 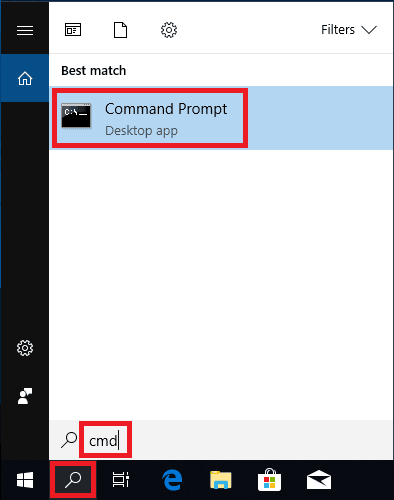 So let’s check if you have one configured on your system. Type “javac -version” and press ENTER. The above command prints the installed JDK version. For Kotlin you need JDK version 1.6 or higher. 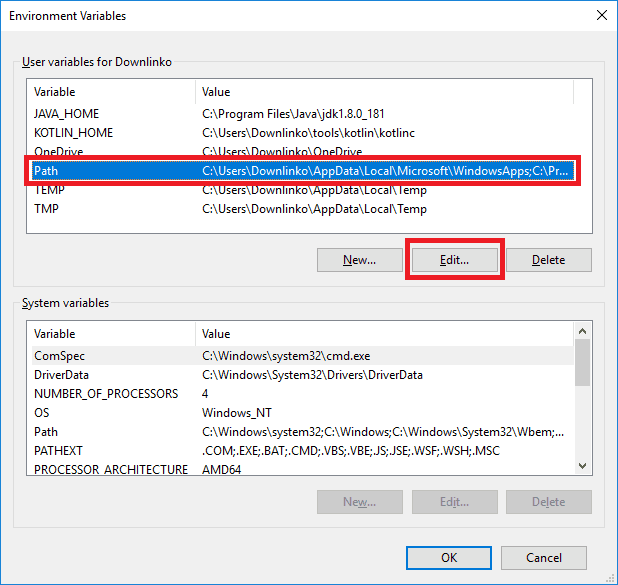 If you do not have a Java Development Kit installed on your system. 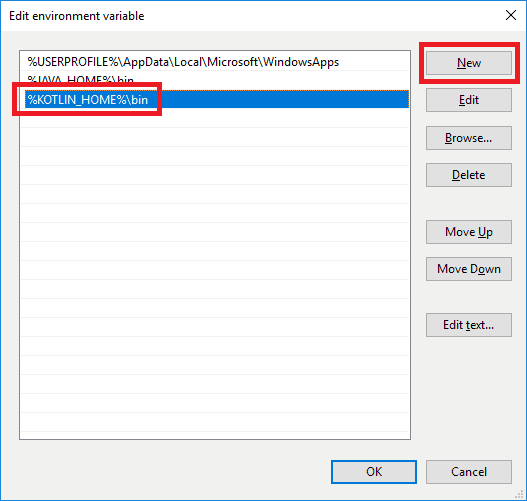 Check following post which details how to install a JDK on Windows 10. Go to the Kotlin Latest Release page on GitHub. Click on the kotlin-compiler-X.X.X.zip link under the Assets section. 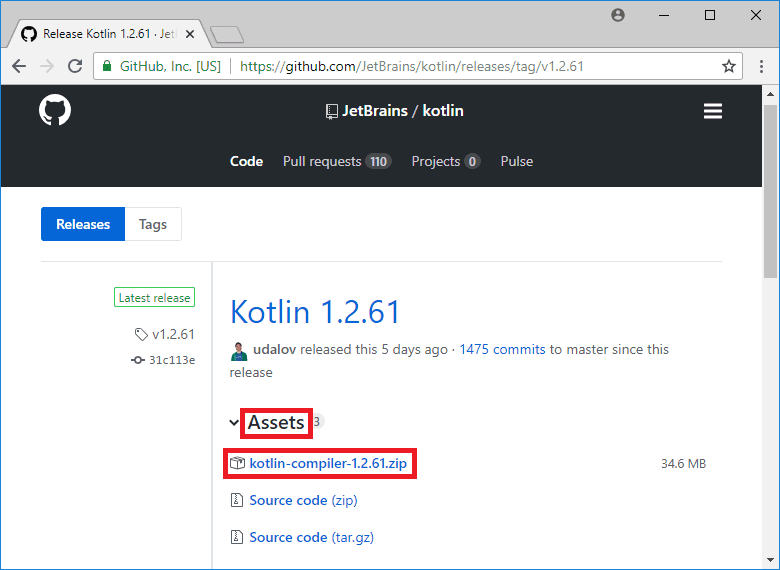 At the time of writing the latest stable Kotlin release was version 1.2.61. Select an extract destination for the Kotlin files. 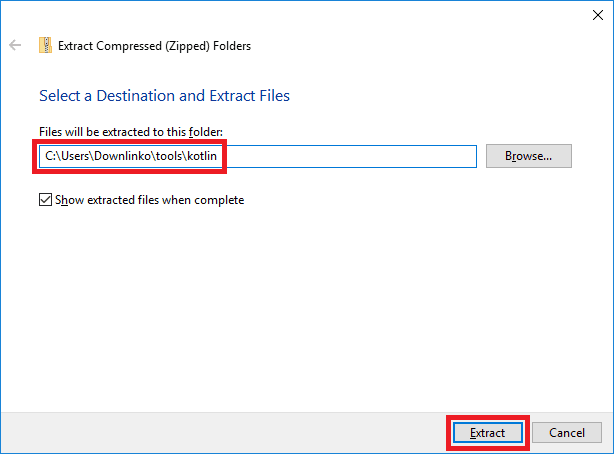 In this example, we extract in C:\Users\Downlinko\tools\kotlin. Click on Extract. 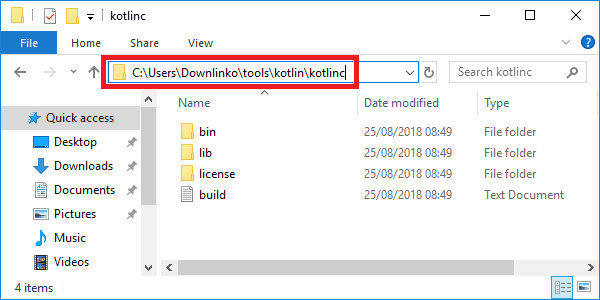 This extracts all kotlin files under C:\Users\Downlinko\tools\kotlin\kotlinc. From now on we refer to this location as [KOTLIN_INSTALL_DIR]. 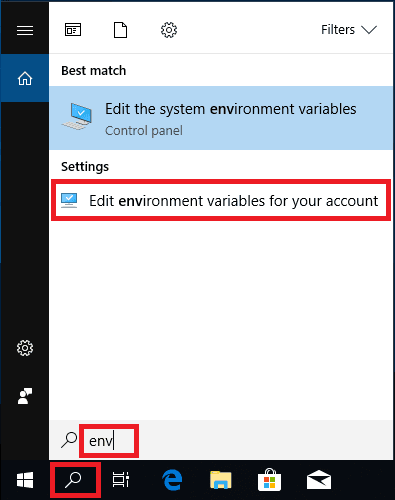 We need to set up an environment variable that will point to our Kotlin installation. Enter “KOTLIN_HOME” as variable name. Enter the [KOTLIN_INSTALL_DIR] as variable value. 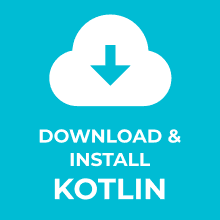 In this tutorial the installation directory is: C:\Users\Downlinko\tools\kotlin\kotlinc. 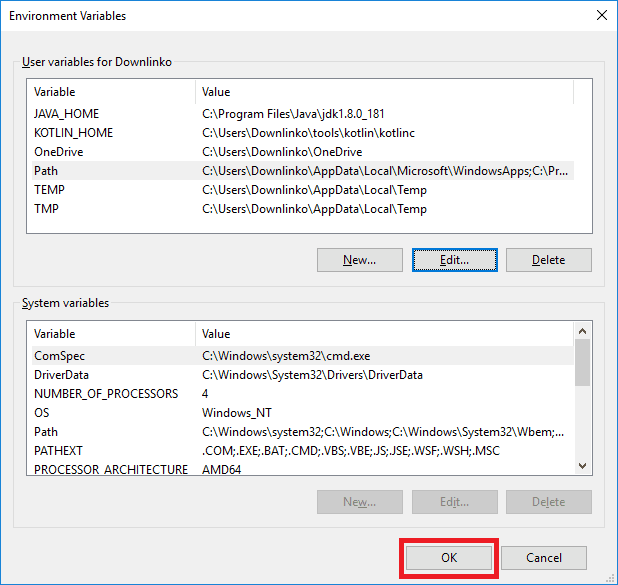 Next, we need to configure the PATH environment variable so we can run Kotlin from a command prompt. Click on New and type “%KOTLIN_HOME%\bin” as shown below. 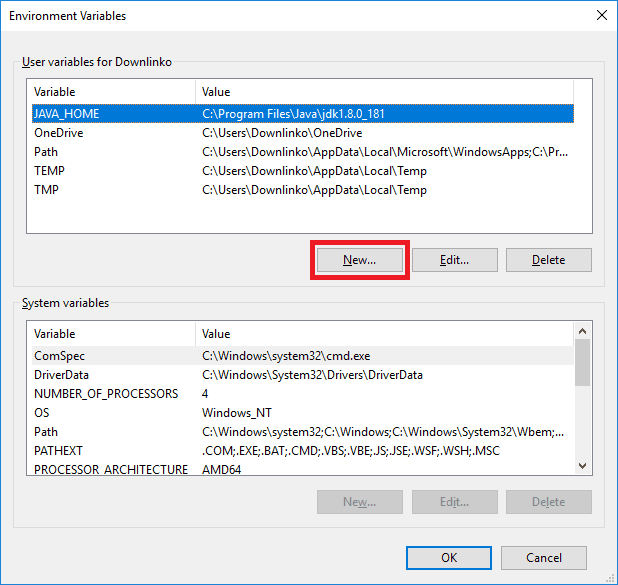 On Windows 7 you cannot add extra values for an existing Path variable. You need to append “;%KOTLIN_HOME%\bin” at the end of the variable value instead. Type “kotlinc -version” and press ENTER. The above command prints the installed Kotlin version. 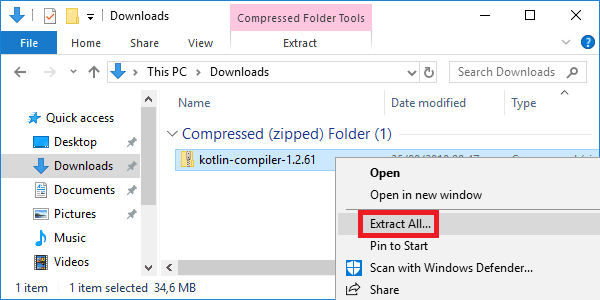 Congratulations, you have installed Kotlin on Windows 10! Now get started and write your first lines of Kotlin code. Be sure to leave a comment if you liked this post.